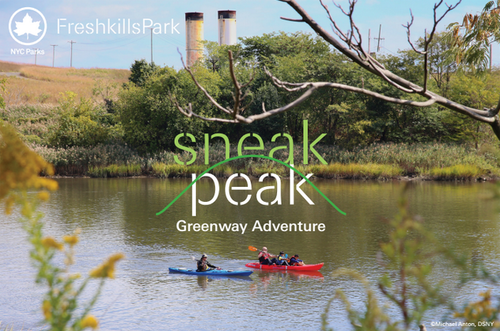 Sneak 'Peak' is a one-day festival celebrating the landfill-to-park conversion happening on Staten Island. The 2,200 acre park is open to the public once a year during Sneak Peak and allows visitors to join in activities such as kayaking, biking, science talks and for the second year, BALLOON/KITE PHOTOGRAPHY! During the Sneak Peak event this year, we hope to continue our research and collect more data about phragmites. The event last year hosted 3,000 participants in which we conducted a balloon mapping workshop. This year the event is expecting to have over 5,000 people in attendance. We hope to be able to inspire and leverage this group of visitors to help map where phragmites is located in the park with balloon/kite photography. With this next aerial photography effort, we hope to be able to track the progress(or lack of progress) of phragmites in the North Mound Wetlands area. We want to set up on the north mound by the wetlands. launch the balloon in the morning, review results over lunch, go out again in the afternoon.